The following material is based on original research of RET, J. Geml, and L. Grubisha. pileus 60 - 70 mm wide, yellow to orange to yellow-orange, often with pinkish tints, convex then planar, ?? ; context yellow for a thickness of 5± mm below pileipellis, otherwise white; margin striate at maturity, at times bearing cottony white fragments of partial veil; universal veil as small patches or scales or warts, occasionally as thin subtranslucent patch over disc becoming warts or scales toward margin, whitish yellow at first, then white; pileipellis ?butter yellow in cross-section. lamellae free to adnexed, ? ?, white, ?? ; lamellulae ??. stipe 60 - 80 × 15 - 31 mm (length doesn’t?? includes bulb), cylindric or broadest at mid-point, fibrillose in concentric bands, ?? ; context firmly stuffed to partially hollow (with lacuna or lacunae in central cylinder), white; bulb up to 39 × 25 mm; partial veil fragile, shredding, often detersile (at least in part); universal veil ? ?, limbate or ocreate, 0.5± mm or more thick, with free limb up to 10± mm high and attached near bulb apex, ??color? ?, firm, persistent, ? ?cannot read last line of notes on Grubisha 864??. [30/1/1] (10.0-) 10.5 - 12.6 (-14.0) × 6.5 - 7.5 (-8.5) μm, (L = 11.6 μm; L’ = 11.6 μm; W = 7.1 μm; W’ = 7.1 μm; Q = (1.43-) 1.50 - 1.71 (-1.77); Q = 1.64; Q’ = 1.64), colorless, hyaline, smooth, thin-walled, inamyloid, ellipsoid to elongate, adaxially flattened, sometimes expanded at one end; apiculus sublateral, cylindric to truncate-conic; contents ?? ; probably white or whitish in deposit. ecology Solitary. With Quercus sp. (Fagaceae) and Arctostaphylos (Ericaceae) and other shrubs on hill top consisting largely of rock, with thick organic layer of Lyonothamnus Gray below. material examined U.S.A.: CALIFORNIA—Sta. Barbara Co. - Channel Islands Nat. Pk., Sta. Cruz Isl., “Ironwood RR” [??°??'??" N/ 119°45'00" W], 14.i.2002 L. Grubisha 862 (UCB ? ?, as “A. muscaria var. formosa,” “AM20” in (Geml et al. 2008)), 864 (UCB ?? as “A. 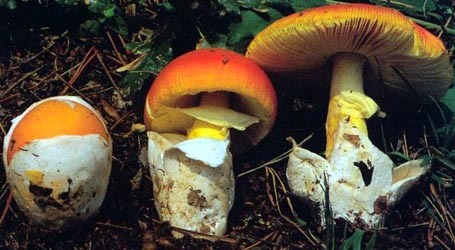 muscaria var. formosa,” “AM21” in (Geml et al. 2008)). discussion The collections on which this taxon is based were collected during an ATBI of Santa Cruz Island conducted by ??. The provisional diagnosis of the material was A. muscaria var. formosa sensu auct. amer. (i.e., var. guessowii) because of the pileus coloration. However, the likelihood that the material represented an unnamed taxon was observed when the prelimary results of sequencing were organized as a phylogenetic tree (Geml et al. 2008). The present taxon corresponds to clade VI of Geml et al. 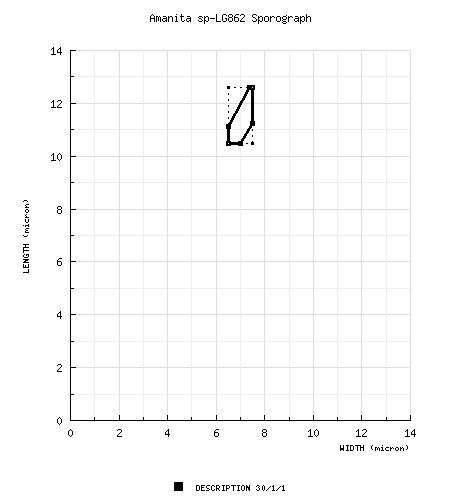 (2008: Fig. 1. In the phylogeny of Geml et al., the present taxon shares a common ancestor with A. muscaria var. persicina (clade III) and A. sp-LG1045 (clade V) and is basal in this grouping of similarly pigmented taxa. The present species is known only from Santa Cruz Island.